Las Vegas, Nov. 16, 2015 -Hartzell Propeller is introducing a new five-blade composite swept tip prop specially designed to maximize performance for the Pilatus PC-12 fleet. The 2016 model PC-12 NG will feature the new five-blade, 105-inch diameter, composite propeller as standard equipment. The new propellers also are available immediately for the sizable Pilatus PC-12 fleet of more than 1,300 business aircraft. The announcement was made today at the National Business Aviation Association Annual Convention & Exhibition, which officially will begin Nov. 17 in Las Vegas. Hartzell’s new propeller will be on display at Hartzell’s NBAA Central Hall Booth C7629 as well as on the newest PC-12 in the Pilatus Booth C12416. “The Pilatus PC-12 with Hartzell’s newest aerodynamic five-blade prop will give owners and operators even better performance and the reliability to meet personal and business travel requirements,” said Hartzell Propeller President Joe Brown. Hartzell offers the new composite five-blade Pilatus PC-12 STC with 3,600 hour/3 year Top Prop warranty. 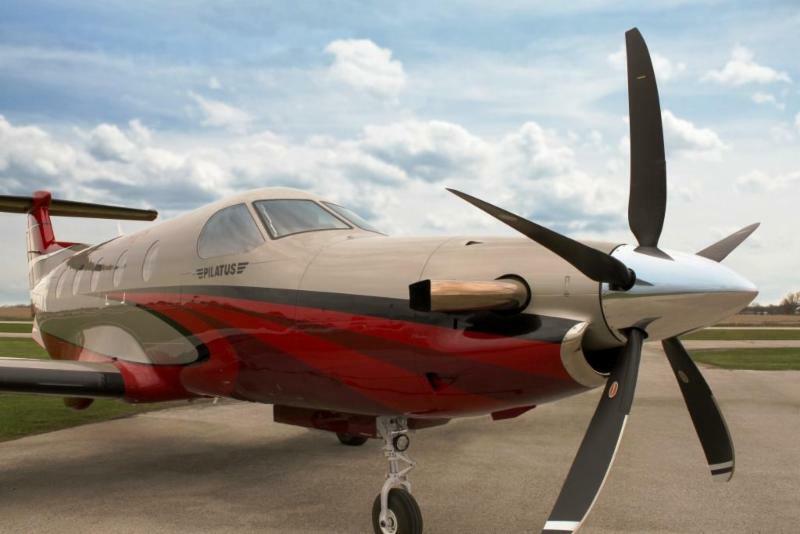 List price for the new Pilatus PC-12 propeller is $83,640, less a $15,000 trade-in for the existing four-blade Hartzell prop installed as standard on PC-12 aircraft. The new structural composite five-blade propeller is seven pounds lighter than the standard four-blade aluminum propeller, and lighter than alternative wood core five-blade propellers. Designed for increased takeoff, climb and cruise performance, the new five-blade swept tip prop from Hartzell Propeller has received a Supplemental Type Certificate from the FAA for installation on PC-12s. Hartzell’s Structural composite utilizes aerospace grade carbon fiber.